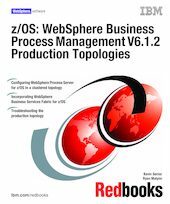 This IBM Redbooks publication describes how to choose and configure a production topology for WebSphere Process Server for z/OS and WebSphere Business Services Fabric for z/OS . This paper book will be useful to infrastructure architects and systems programmers. Because WebSphere Process Server for z/OS interfaces with DB2® for z/OS and with a security manager such as RACF, this book is also relevant to security administrators and to database administrators. Chapter 1 discusses BPM production topologies for z/OS. Chapter 2 contains step-by-step instructions for configuring both a single-cluster topology and a two-cluster topology using WebSphere Process Server V6.1.2 for z/OS. Chapter 3 describes how to add WebSphere Business Services Fabric V6.1.2 for z/OS to your production topology, and how to verify the installation. Chapter 4 documents errors encountered creating the Business Process Management production topology on z/OS, and describes how to overcome these errors. This book provides additional material, including the spreadsheet used to plan the cell’s topology, sample JCL, and the shell scripts used to simplify some steps.